Many believe that drinking and eating later in the evening is not ideal for your health. 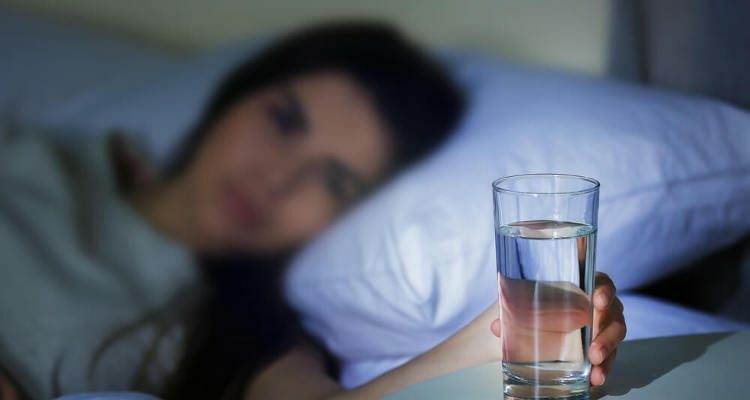 However, there is one drink that has the potential to provide better sleep and help in maintaining a healthy lifestyle. Drinking lemon water before bed can provide many health benefits and help detox the body overnight, thanks to the nutrition that can be found in the citrus fruit. It has no saturated fat or cholesterol and very little sodium but is a good source of folate and potassium. Lemons provide vital vitamins and minerals that are important in keeping a healthy body. An easy way to consume them is to drink them in water, and before bed is actually a beneficial time to drink it. Lemon water nutrition offers a variety of health benefits, and below we will discuss many of them and if there are any possible side effects. For a Serving Size of 244g, it contains 61 calories. *Percent Daily Values are based on a 2,000 calorie diet. 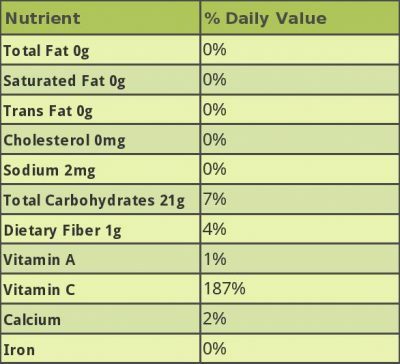 Your daily values could be higher or lower depending on calorie needs. The high vitamin C content in lemon water is one of the main reasons for its nutrition value and health benefits. Drinking this may help naturally balance the body’s vitamins, nutrients, and minerals, and replenish what is used during the day. This can stabilize hormones, increase energy levels the next day, and help repair muscles and joints, helping the body to relax and feel replenished and rejuvenated the next morning. Over time, drinking lemon water before bed could result in sleeping more soundly. On the other hand, it may also make you feel energetic. For this reason, some experts recommend starting your day with warm lemon water instead. Drinking hot lemon water before bed may seem like a good idea, but some have suggested trying it cold to lose a few pounds. The idea is that water is a natural calorie burner, and sipping ice water is one way to burn extra calories. When drinking cold lemon water, the body needs to work harder to warm up, increasing the rate your metabolism burns up calories, some say. But drinking it cold may actually impact the digestion process negatively. Although your body will work to make the cold water warm, the effort required will burn more energy and not as much fat. Warm lemon water works just fine. Drinking lemon water at night provides many vitamins and minerals that are beneficial to overall health. Vitamin C is the most potent antioxidant that lemon water supplies, which is a great immune system booster and is also good for the skin! Vitamin C, also known as ascorbic acid, boosts the immune system by attacking the nucleic acid of any virus that may be in the body. The antioxidant vitamin fights with bacteria until they are dead and no longer a threat to the immune system. It is also known that vitamin C stimulates the production of white blood cells, which are vital for proper function of the immune system. Since the body is mostly water, it needs to keep hydrated in order for it to work properly throughout the day. While sleeping, the body is not working as hard, so it doesn’t need to excrete as many fluids. Drinking lemon water before bed may help you refill the necessary levels and rehydrate what was lost during the day. Keeping the body hydrated will help pump blood through blood vessels to the muscles, which in turn helps the muscles work more efficiently. Having a glass of lemon water before bed can help regulate bowel movements and improve digestion. Over time, if lemon water is consumed regularly, problems with constipation may lessen. Lemon water will also provide enhanced nutrient absorption, which can reduce bloating. Lemon water can also stimulate the liver and benefit the enzyme functions in the body. The negatively charged ions found in lemons will increase energy levels and work as a mood booster. Fresh lemon water helps to oxygenate the body, which will also increase energy levels. So the next time you are feeling down, drinking a glass of lemon water could help, but it may be best taken in the morning to avoid a sleepless night of charged up energy. Lemon water is considered a diuretic that has the potential to rid the body of unwanted elements. Drinking a cup of warm lemon water in the evening before bedtime allows the body to slowly detox throughout the night. Daily exposure to different toxins through the water we drink and the air we breathe can be flushed out by drinking lemon water before bed. However, a drawback may be frequent trips to the bathroom for relief. Drinking lemon water is one of the easiest ways to add some nutrition to your daily diet. Making it is simple and can be done right before bedtime or in large batches for later. Lemon water is made by simply squeezing a lemon into some water. You can drop the peel in the water after squeezing, but make sure it has been washed as pesticides can otherwise leak from the peel into the water. 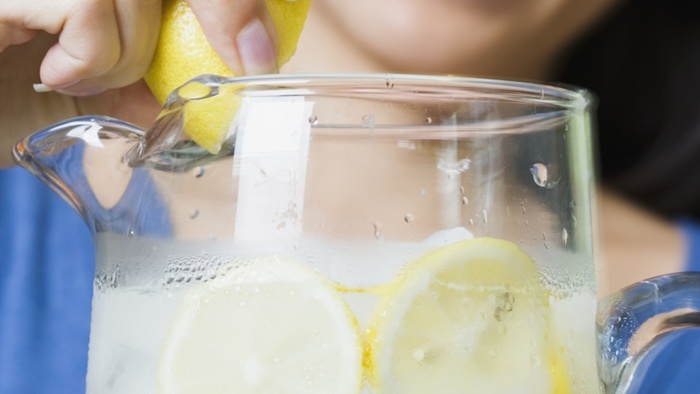 Choose the temperature of water you would like, either warm or cold, and add in the lemon. It is that simple. Making large quantities is often easiest, and less time-consuming in the long run. Simply boil lemon halves in water and pour into mason jars to cool, storing in the fridge for later. Are There Any Side Effects of Drinking Lemon Water before Bed? Drinking lemon water before bed is pretty safe, but there are some possible side effects, so caution should be taken. The acid in the lemon can cause damage to tooth enamel, so it is advisable to always brush teeth after drinking the bedtime water. It is best to drink lemon water through a straw and to rinse the mouth thoroughly. This will neutralize any acid on the teeth. The acid in lemon water may also cause discomfort to those with stomach problems. Drinking lemon water before bed is one of the easiest ways to live a more healthy lifestyle. Packed with nutrients and low in calories, it can help in preventing many health issues and offer more energy throughout the day. Experts recommend drinking a cup of lemon water before going to bed to boost the immune system and eliminate toxins from the body. To wake up well-rested and full of energy, be sure to drink one glass of lemon water every night!